Not to be confused with Dihydrocodeine. Hydrocodone, sold under the brand name Hysingla among others, is an opioid used to treat severe pain of a prolonged duration, if other measures are not sufficient. It also used as a cough suppressant in adults. It is taken by mouth. Typically it is sold as the combinations acetaminophen/hydrocodone or ibuprofen/hydrocodone. By itself it is sold in a long acting formulation. Common side effects include dizziness, sleepiness, nausea, and constipation. Serious side effects may include abuse, low blood pressure, seizures, QT prolongation, respiratory depression, and serotonin syndrome. Rapidly decreasing the dose may result in opioid withdrawal. Use during pregnancy or breastfeeding is generally not recommended. Hydrocodone is believed to work by activating opioid receptors, mainly in the brain and spinal cord. Hydrocodone 10 mg is equivalent to about 10 mg of morphine by mouth. Hydrocodone was patented in 1923 well the long acting formation was approved for medical use in the United States in 2013. In the United States the wholesale cost of the long acting formulation is about 10 to 30 USD per dose as of 2019. It is most commonly prescribed in the United States, which consumed 99% of the worldwide supply as of 2010. In 2016 it was the 113th most prescribed medication in the United States with more than 6 million prescriptions. It is made from the opium poppy after it has been converted to codeine. Hydrocodone is used to treat moderate to severe pain. In liquid formulations, it is used to treat cough. In one study comparing the potency of hydrocodone to that of oxycodone, it was found that it took 50% more hydrocodone to achieve the same degree of miosis (pupillary contraction). The investigators interpreted this to mean that oxycodone is about 50% more potent than hydrocodone. However, in a study of emergency department patients with fractures, it was found that an equal amount of either drug provided about the same degree of pain relief, indicating that there is little practical difference between them when used for that purpose. Some references state that the analgesic action of hydrocodone begins in 20–30 minutes and lasts about 4–8 hours. The manufacturer’s information says onset of action is about 10–30 minutes and duration is about 4–6 hours. Recommended dosing interval is 4–6 hours. The original oral form of hydrocodone alone, Dicodid, as immediate-release 5 and 10 mg tablets is available for prescription in Continental Europe per national drug control and prescription laws and Title 76 of the Schengen Treaty, but dihydrocodeine has been more widely used for the same indications since the beginning in the early 1920s, with hydrocodone being regulated the same way as morphine in the German Betäubungsmittelgesetz, the similarly named law in Switzerland and the Austrian Suchtmittelgesetz, whereas dihydrocodeine is regulated like codeine. For a number of decades, the liquid hydrocodone products available are cough medicines. Hydrocodone plus homatropine (Hycodan) in the form of small tablets for coughing and especially neuropathic moderate pain (the homatropine, an anticholinergic, is useful in both of those cases and is a deterrent to intentional overdose) was more widely used than Dicodid and was labelled as a cough medicine in the United States whilst Vicodin and similar drugs were the choices for analgesia. Extended-release hydrocodone in a time-release syrup also containing chlorphenamine/chlorpheniramine is a cough medicine called Tussionex in North America. In Europe, similar time-release syrups containing codeine (numerous), dihydrocodeine (Paracodin Retard Hustensaft), nicocodeine (Tusscodin), thebacon, acetyldihydrocodeine, dionine, and nicodicodeine are used instead. Hydrocodone is not available in parenteral or any other non-oral forms. Common side effects of hydrocodone are nausea, vomiting, constipation, drowsiness, dizziness, lightheadedness, anxiety, abnormally happy or sad mood, dry throat, difficulty urinating, rash, itching, and contraction of the pupils. Serious side effects include slowed or irregular breathing and chest tightness. Several cases of progressive bilateral hearing loss unresponsive to steroid therapy have been described as an infrequent adverse reaction to hydrocodone/paracetamol misuse. This adverse effect has been considered by some to be due to the ototoxicity of hydrocodone. Other researchers have suggested that paracetamol is the primary agent responsible for the ototoxicity. Hydrocodone is in U.S. Food and Drug Administration (FDA) pregnancy category C. No adequate and well-controlled studies in humans have been conducted. A newborn of a mother taking opioid medications regularly prior to the birth will be physically dependent. The baby may also exhibit respiratory depression if the opioid dose was high. An epidemiological study indicated that opioid treatment during early pregnancy results in increased risk of various birth defects. Hydrocodone can be habit forming, causing physical and psychological dependence. Its abuse liability is similar to morphine and less than oxycodone. Patients consuming alcohol, other opioids, anticholinergic antihistamines, anti-psychotics, anti-anxiety agents, or other central nervous system (CNS) depressants together with hydrocodone may exhibit an additive CNS depression. Hydrocodone may interact with serotonergic medications. Hydrocodone is a highly selective full agonist of the μ-opioid receptor (MOR). This is the main biological target of the endogenous opioid neuropeptide β-endorphin. Hydrocodone has low affinity for the δ-opioid receptor (DOR) and the κ-opioid receptor (KOR), where it is an agonist similarly. Studies have shown hydrocodone is stronger than codeine but only one-tenth as potent as morphine at binding to receptors and reported to be only 59% as potent as morphine in analgesic properties. However, in tests conducted on rhesus monkeys, the analgesic potency of hydrocodone was actually higher than morphine. Oral hydrocodone has a mean equivalent daily dosage (MEDD) factor of 0.4, meaning that 1 mg of hydrocodone is equivalent to 0.4 mg of intravenous morphine. However, because of morphine’s low oral bioavailability, there is a 1:1 correspondence between orally administered morphine and orally administered hydrocodone. The relative milligram strength of hydrocodone to codeine is given as 6 fold, that is 5 mg has the effect of 30 mg of codeine; by way of the Roman numeral VI this is said to have given rise to the trade name Vicodin. Hydrocodone is only pharmaceutically available as an oral medication. It is well-absorbed, but the oral bioavailability of hydrocodone is only approximately 25%. The onset of action of hydrocodone via this route is 10 to 20 minutes, with a peak effect (Tmax) occurring at 30 to 60 minutes, and it has a duration of 4 to 8 hours. The volume of distribution of hydrocodone is 3.3 to 4.7 L/kg. The plasma protein binding of hydrocodone is 20 to 50%. In the liver, hydrocodone is transformed into several metabolites, including norhydrocodone, hydromorphone, 6α-hydrocodol (dihydrocodeine), and 6β-hydrocodol. 6α- and 6β-hydromorphol are also formed, and the metabolites of hydrocodone are conjugated (via glucuronidation). Hydrocodone has a terminal half-life that averages 3.8 hours (range 3.3–4.4 hours). The hepatic cytochrome P450 enzyme CYP2D6 converts hydrocodone into hydromorphone, a more potent opioid (5-fold higher binding affinity to the MOR). However, extensive and poor cytochrome 450 CYP2D6 metabolizers had similar physiological and subjective responses to hydrocodone, and CYP2D6 inhibitor quinidine did not change the responses of extensive metabolizers, suggesting that inhibition of CYP2D6 metabolism of hydrocodone has no practical importance. Ultra-rapid CYP2D6 metabolizers (1–2% of the population) may have an increased response to hydrocodone; however, hydrocodone metabolism in this population has not been studied. Norhydrocodone, the major metabolite of hydrocodone, is predominantly formed by CYP3A4-catalyzed oxidation. In contrast to hydromorphone, it is described as inactive. However, norhydrocodone is actually a MOR agonist with similar potency to hydrocodone, but has been found to produce only minimal analgesia when administered peripherally to animals (likely due to poor blood–brain barrier and thus central nervous system penetration). Inhibition of CYP3A4 in a child who was, in addition, a poor CYP2D6 metabolizer, resulted in a fatal overdose of hydrocodone. Approximately 40% of hydrocodone metabolism is attributed to non-cytochrome P450-catalyzed reactions. Hydrocodone is excreted in urine, mainly in the form of conjugates. Hydrocodone concentrations are measured in blood, plasma, and urine to seek evidence of misuse, to confirm diagnoses of poisoning, and to assist in investigations into deaths. Many commercial opiate screening tests react indiscriminately with hydrocodone, other opiates, and their metabolites, but chromatographic techniques can easily distinguish hydrocodone uniquely. Blood and plasma hydrocodone concentrations typically fall into the 5–30 µg/L range among people taking the drug therapeutically, 100–200 µg/L among recreational users, and 100–1,600 µg/L in cases of acute, fatal overdosage. Co-administration of the drug with food or alcohol can very significantly increase the resulting plasma hydrocodone concentrations that are subsequently achieved. Hydrocodone was first marketed by Knoll as Dicodid, starting in February 1924 in Germany. This name is analogous to other products the company introduced or otherwise marketed: Dilaudid (hydromorphone, 1926), Dinarkon (oxycodone, 1917), Dihydrin (dihydrocodeine, 1911), and Dimorphan (dihydromorphine). Paramorfan is the trade name of dihydromorphine from another manufacturer, as is Paracodin, for dihydrocodeine. The name Dicodid was registered in the United States and appears without a monograph as late as 1978 in the Physicians’ Desk Reference; Dicodid may have been marketed to one extent or another in North America in the 1920s and early 1930s. The drug was pure hydrocodone in small 5 and 10 mg tablets, physically similar to the Dilaudid tablets. It is no longer manufactured by Knoll in Germany, nor is a generic available. Hydrocodone was never as common in Europe as it is in North America—dihydrocodeine is used for its spectrum of indications. Germany was the number two consumer of hydrocodone until the manufacture of the drug was discontinued there. Now,[when?] the world outside the United States accounts for less than 1% of annual consumption. It was listed as a Suchtgift under the German Betäubungsmittelgesetz and regulated like morphine. It became available in the Schengen Area of the European Union as of 1 January 2002 under Title 76 of the Schengen Treaty. 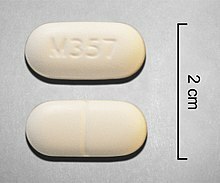 Several common imprints for hydrocodone are M365, M366, M367. Most hydrocodone is formulated in combination with a second analgesic, such as paracetamol (acetaminophen) or ibuprofen. Examples of hydrocodone combinations include Norco, Vicodin, Lortab, Vicoprofen and Riboxen. In 2014, the FDA approved a formulation of hydrocodone called Zohydro ER made by Zogenix Pharmaceuticals. The approval of Zohydro ER was controversial, due to concerns over its potential for substance abuse. The FDA approved Zohydro ER over the objections of its own review panel, which voted 12 to 2 against approval. The panel stated that if approved, Zohydro ER would likely “be abused, possibly at a rate greater than that of currently available hydrocodone combination products”. Thirty U.S. states asked the FDA not to approve Zohydro ER in capsule form due to its potency and the ease with which it could be abused, by being crushed and then snorted or injected. [medical citation needed] Zohydro ER was briefly prohibited in Massachusetts before a federal judge ruled that the state’s ban was preempted by the earlier federal approval. The US government imposed tougher prescribing rules for hydrocodone in 2014, changing the drug from Schedule III to Schedule II. In 2011, hydrocodone products were involved in around 100,000 abuse-related emergency department visits in the United States, more than double the number in 2004. ^ a b c d e f g h Jennifer A. Elliott; Howard S. Smith (19 April 2016). Handbook of Acute Pain Management. CRC Press. pp. 79–. ISBN 978-1-4665-9635-1. ^ a b c d e f g Shufeng Zhou (6 April 2016). Cytochrome P450 2D6: Structure, Function, Regulation and Polymorphism. CRC Press. pp. 164–. ISBN 978-1-4665-9788-4. ^ a b c Gary S. Firestein; Ralph Budd; Sherine E. Gabriel; Iain B. McInnes; James R. O’Dell (21 June 2016). Kelley and Firestein’s Textbook of Rheumatology. Elsevier Health Sciences. pp. 1081–. ISBN 978-0-323-41494-4. ^ a b c d Bruce A. Chabner; Dan L. Longo (8 November 2010). Cancer Chemotherapy and Biotherapy: Principles and Practice. Lippincott Williams & Wilkins. pp. 700–. ISBN 978-1-60547-431-1. ^ a b c Mellar P. Davis; Paul Glare; Janet Hardy (2005). Opioids in Cancer Pain. Oxford University Press. pp. 59–68. ISBN 978-0-19-852943-9. ^ a b Martin H. Bluth (16 November 2016). Toxicology and Drug Testing, An Issue of Clinics in Laboratory Medicine, E-Book. Elsevier Health Sciences. pp. 85–. ISBN 978-0-323-47795-6. ^ a b Howard S. Smith (21 February 2013). Opioid Therapy in the 21st Century. OUP USA. pp. 68–. ISBN 978-0-19-984497-5. ^ a b c d e f g h i j k “Hydrocodone Bitartrate Monograph for Professionals”. Drugs.com. American Society of Health-System Pharmacists. Retrieved 15 April 2019. ^ “Hydrocodone: MedlinePlus Drug Information”. medlineplus.gov. Retrieved 15 April 2019. ^ Briggs, Gerald G.; Freeman, Roger K.; Yaffe, Sumner J. (2011). Drugs in Pregnancy and Lactation: A Reference Guide to Fetal and Neonatal Risk. Lippincott Williams & Wilkins. p. 692. ISBN 9781608317080. ^ “Hydrocodone Use During Pregnancy”. Drugs.com. Retrieved 15 April 2019. ^ “Opioid Dose Calculator”. www.agencymeddirectors.wa.gov. Retrieved 15 April 2019. ^ Fischer, Jnos; Ganellin, C. Robin (2006). Analogue-based Drug Discovery. John Wiley & Sons. p. 526. ISBN 9783527607495. ^ “Making Some Painkillers Harder to Get”. The New York Times. 21 February 2013. Retrieved 15 April 2019. ^ Stoker, H. Stephen (2012). General, Organic, and Biological Chemistry. Cengage Learning. p. 567. ISBN 9781133711285. ^ Zacny JP, Gutierrez S (April 2009). “Within-subject comparison of the psychopharmacological profiles of oral hydrocodone and oxycodone combination products in non-drug-abusing volunteers”. Drug Alcohol Depend. 101 (1–2): 107–14. doi:10.1016/j.drugalcdep.2008.11.013. PMID 19118954. ^ Marco CA, Plewa MC, Buderer N, Black C, Roberts A (April 2005). “Comparison of oxycodone and hydrocodone for the treatment of acute pain associated with fractures: a double-blind, randomized, controlled trial”. Acad Emerg Med. 12 (4): 282–8. doi:10.1197/j.aem.2004.12.005. PMID 15805317. ^ a b c Vallejo R, Barkin RL, Wang VC (2011). “Pharmacology of opioids in the treatment of chronic pain syndromes”. Pain Physician. 14 (4): E343–60. PMID 21785485. ^ “Opioid (Narcotic Analgesics and Acetaminophen Systemic )”. Retrieved 22 March 2014. ^ Mary Lynn McPherson (24 August 2009). Demystifying Opioid Conversion Calculations: A Guide for Effective Dosing. ASHP. pp. 187–188. ISBN 978-1-58528-297-5. ^ Jan Odom-Forren; Cecil Drain (11 February 2008). PeriAnesthesia Nursing: A Critical Care Approach. Elsevier Health Sciences. pp. 751–. ISBN 978-1-4377-2610-7. ^ Linda Skidmore-Roth (27 June 2013). Mosby’s Drug Guide for Nursing Students, with 2014 Update. Elsevier Health Sciences. pp. 524–. ISBN 978-0-323-22268-6. ^ Vadivelu, Nalini; Schermer, Erika; Kodumudi, Gopal; Berger, Jack M. (2016). “The Clinical Applications of Extended-Release Abuse-Deterrent Opioids”. CNS Drugs. 30 (7): 637–646. doi:10.1007/s40263-016-0357-0. ISSN 1172-7047. PMID 27290716. ^ a b MedlinePlus; Drug Information: Hydrocodone. Last Revised—1 October 2008. Retrieved on 20 April 2013. ^ Friedman RA, House JW, Luxford WM, Gherini S, Mills D (March 2000). “Profound hearing loss associated with hydrocodone/acetaminophen abuse”. Am J Otol. 21 (2): 188–91. doi:10.1016/S0196-0709(00)80007-1. PMID 10733182. ^ Ho T, Vrabec JT, Burton AW (May 2007). “Hydrocodone use and sensorineural hearing loss”. Pain Physician. 10 (3): 467–72. PMID 17525781. Archived from the original on 23 July 2011. ^ Yorgason JG, Kalinec GM, Luxford WM, Warren FM, Kalinec F (June 2010). 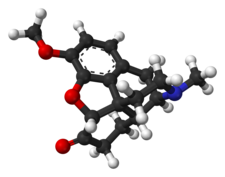 “Acetaminophen ototoxicity after acetaminophen/hydrocodone abuse: evidence from two parallel in vitro mouse models”. Otolaryngol Head Neck Surg. 142 (6): 814–9, 819.e1–2. doi:10.1016/j.otohns.2010.01.010. PMID 20493351. ^ Curhan SG, Eavey R, Shargorodsky J, Curhan GC (March 2010). “Analgesic use and the risk of hearing loss in men”. Am. J. Med. 123 (3): 231–7. doi:10.1016/j.amjmed.2009.08.006. PMC 2831770. PMID 20193831. ^ a b “REPREXAIN (hydrocodone bitartrate, ibuprofen) tablet, film coated”. dailymed.nlm.nih.gov. NIH. Retrieved 27 April 2013. ^ Broussard CS, Rasmussen SA, Reefhuis J, Friedman JM, Jann MW, Riehle-Colarusso T, Honein MA (April 2011). “Maternal treatment with opioid analgesics and risk for birth defects”. Am. J. Obstet. Gynecol. 204 (4): 314.e1–11. doi:10.1016/j.ajog.2010.12.039. PMID 21345403. ^ Wightman R, Perrone J, Portelli I, Nelson L (December 2012). “Likeability and abuse liability of commonly prescribed opioids”. J Med Toxicol. 8 (4): 335–40. doi:10.1007/s13181-012-0263-x. PMC 3550270. PMID 22992943. ^ Gnanadesigan N, Espinoza RT, Smith RL (June 2005). “The serotonin syndrome”. N. Engl. J. Med. 352 (23): 2454–6, author reply 2454–6. doi:10.1056/NEJM200506093522320. PMID 15948273. ^ Filizola M, Villar HO, Loew GH (January 2001). “Molecular determinants of non-specific recognition of delta, mu, and kappa opioid receptors”. Bioorg. Med. Chem. 9 (1): 69–76. doi:10.1016/S0968-0896(00)00223-6. PMID 11197347. ^ David H. Chestnut; Cynthia A Wong; Lawrence C Tsen; Warwick D Ngan Kee; Yaakov Beilin; Jill Mhyre, eds. (28 February 2014). Chestnut’s Obstetric Anesthesia: Principles and Practice E-Book. Elsevier Health Sciences. pp. 611–. ISBN 978-0-323-11374-8. ^ Thompson CM, Wojno H, Greiner E, May EL, Rice KC, Selley DE (February 2004). “Activation of G-proteins by morphine and codeine congeners: insights to the relevance of O- and N-demethylated metabolites at mu- and delta-opioid receptors”. J. Pharmacol. Exp. Ther. 308 (2): 547–54. doi:10.1124/jpet.103.058602. PMID 14600248. ^ Nicholas J Talley; Brad Frankum; David Currow (10 February 2015). Essentials of Internal Medicine 3e. Elsevier Health Sciences. pp. 491–. ISBN 978-0-7295-8081-6. ^ “Instructions for Mean Equivalent Daily Dose (MEDD)” (PDF). Archived from the original (PDF) on 27 July 2011. Retrieved 22 August 2010. ^ Mary C. Brucker; Tekoa L. King (8 September 2015). Pharmacology for Women’s Health. Jones & Bartlett Publishers. pp. 322–. ISBN 978-1-284-05748-5. ^ Steven B. Karch (9 October 2007). Pharmacokinetics and Pharmacodynamics of Abused Drugs. CRC Press. pp. 56–. ISBN 978-1-4200-5460-6. ^ Amitava Dasgupta; Jorge L. Sepulveda (22 January 2013). Accurate Results in the Clinical Laboratory: A Guide to Error Detection and Correction. Newnes. pp. 239–. ISBN 978-0-12-415858-0. ^ a b Amitava Dasgupta; Loralie J. Langman (23 April 2012). Pharmacogenomics of Alcohol and Drugs of Abuse. CRC Press. pp. 175–. ISBN 978-1-4398-5611-6. ^ Kaplan HL, Busto UE, Baylon GJ, Cheung SW, Otton SV, Somer G, Sellers EM (April 1997). “Inhibition of cytochrome P450 2D6 metabolism of hydrocodone to hydromorphone does not importantly affect abuse liability”. J. Pharmacol. Exp. Ther. 281 (1): 103–8. PMID 9103485. ^ Gardiner SJ, Begg EJ (September 2006). “Pharmacogenetics, drug-metabolizing enzymes, and clinical practice”. Pharmacol. Rev. 58 (3): 521–90. doi:10.1124/pr.58.3.6. PMID 16968950. ^ Crews KR, Gaedigk A, Dunnenberger HM, Klein TE, Shen DD, Callaghan JT, Kharasch ED, Skaar TC (February 2012). “Clinical Pharmacogenetics Implementation Consortium (CPIC) guidelines for codeine therapy in the context of cytochrome P450 2D6 (CYP2D6) genotype”. Clin. Pharmacol. Ther. 91 (2): 321–6. doi:10.1038/clpt.2011.287. PMC 3289963. PMID 22205192. ^ Navani, D. M.; Yoburn, B. C. (2013). “In Vivo Activity of Norhydrocodone: An Active Metabolite of Hydrocodone”. Journal of Pharmacology and Experimental Therapeutics. 347 (2): 497–505. doi:10.1124/jpet.113.207548. ISSN 1521-0103. PMID 23995596. ^ Madadi P, Hildebrandt D, Gong IY, Schwarz UI, Ciszkowski C, Ross CJ, Sistonen J, Carleton BC, Hayden MR, Lauwers AE, Koren G (October 2010). “Fatal hydrocodone overdose in a child: pharmacogenetics and drug interactions”. Pediatrics. 126 (4): e986–9. doi:10.1542/peds.2009-1907. PMID 20837591. ^ Vuilleumier PH, Stamer UM, Landau R (2012). “Pharmacogenomic considerations in opioid analgesia”. Pharmgenomics Pers Med. 5: 73–87. doi:10.2147/PGPM.S23422. PMC 3513230. PMID 23226064. ^ Spiller HA (March 2003). “Postmortem oxycodone and hydrocodone blood concentrations”. J. Forensic Sci. 48 (2): 429–31. PMID 12665006. ^ Randall C. Baselt (2017). Disposition of Toxic Drugs and Chemicals in Man. Biomedical Publications. pp. 1050–1052. ISBN 978-0-692-77499-1. ^ Mannich, C.; Löwenheim, Helene (1920). “Ueber zwei neue Reduktionsprodukte des Kodeins”. Archiv der Pharmazie. 258 (2–4): 295–316. doi:10.1002/ardp.19202580218. ISSN 0365-6233. ^ “Drugs@FDA—Approval History: Hycodan”. FDA. Retrieved 7 January 2006. ^ International Narcotics Control Board Report 2008. United Nations Pubns. 2009. p. 20. ISBN 978-9211482324. ^ “Hydrocodone Combination Products”. MedlinePlus. The American Society of Health-System Pharmacists, Inc. Retrieved 14 July 2018. ^ a b c d e f g h i Informulary (February 2015). “Drug Facts Box: ZOHYDRO ER (hydrocodone bitartrate)” (PDF). Consumer Reports. Consumer Reports. Retrieved 5 November 2015. ^ Rubin, Rita (27 February 2014). “Critics Oppose FDA Approval of Painkiller Zohydro”. WebMD. Retrieved 14 May 2014. ^ Heger, Monica (7 May 2014). “State challenges to painkiller could threaten FDA authority”. Nature Medicine. Retrieved 14 May 2014. ^ Valencia, Milton (23 April 2014). “Mass. limits use of the potent painkiller Zohydro”. Boston Globe. Retrieved 14 May 2014. ^ McCarthy, Michael (2016). “Prescriptions for hydrocodone plummet after US tightens prescribing rules”. BMJ. 352: i549. doi:10.1136/bmj.i549. ISSN 1756-1833. PMID 26819247. ^ Jones, Christopher M.; Lurie, Peter G.; Throckmorton, Douglas C. (2016). “Effect of US Drug Enforcement Administration’s Rescheduling of Hydrocodone Combination Analgesic Products on Opioid Analgesic Prescribing”. JAMA Internal Medicine. 176 (3): 399–402. doi:10.1001/jamainternmed.2015.7799. ISSN 2168-6106. PMID 26809459. ^ Chambers, Jan; Gleason, Rae M.; Kirsh, Kenneth L.; Twillman, Robert; Webster, Lynn; Berner, Jon; Fudin, Jeff; Passik, Steven D. (2016). “An Online Survey of Patients’ Experiences Since the Rescheduling of Hydrocodone: The First 100 Days”. Pain Medicine. 17 (9): 1686–1693. doi:10.1093/pm/pnv064. ISSN 1526-2375. PMID 26814291. ^ “Schedules of Controlled Substances: Rescheduling of Hydrocodone Combination Products From Schedule III to Schedule II”. Federal Register. 22 August 2014. Retrieved 11 August 2017. ^ Abuse, National Institute on Drug. “Drug-Related Hospital Emergency Room Visits”. Retrieved 11 August 2017. “DEA Schedules of Controlled Substances: Rescheduling of Hydrocodone Combination Products From Schedule III to Schedule II”. Federal Register. 6 October 2014.